I created a Photobucket account for members of HO to use to post pics to be used on the Heartland Outdoors forum. This will help everyone with trying to resize their pics to post them on the forum. It will also help save disk space for the website and not bog it down. 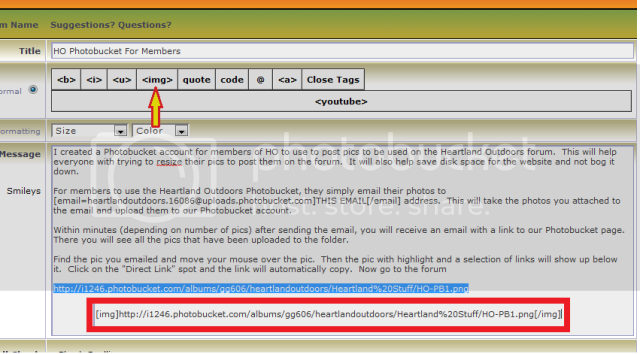 For members to use the Heartland Outdoors Photobucket, they simply email their photos to THIS EMAIL address. This will take the photos you attached to the email and upload them to our Photobucket account. Within minutes (depending on number of pics) after sending the email, you will receive an email with a link to our Photobucket page. There you will see all the pics that have been uploaded to the folder. Once your in the forum and making your post you paste that link in the reply box. Once its there, you highlight the link again and then while its highlighted, click in the img button above. It will add img tags on both sides of the link. That is it. You can preview your post to make sure the image shows up. Reply with any questions. Please use this as it will help the site function and not get overwhelmed with files that take up space on the server. It doesn’t matter. I like using my own so I have all my pics in one spot.